A dye can generally be described as a colored substance that has a chemical affinity to the substrate to which it is being applied. The dye is generally applied in an aqueous solution, and may require a mordant to improve the fastness of the dye on the fiber. Dyeing is the process of imparting color to a textile material in loose fiber, yarn, cloth or garment form by treatment with a dye. Archaeological evidence shows that dyeing has been carried out for over 5,000 years, particularly in India and the Middle East. The dyes were obtained from animal, vegetable, or mineral origin, with no or very little processing. By far the greatest source of dyes has been from the plant kingdom, notably roots, berries, bark, leaves, and wood, but only a few have been used on a commercial scale. Over the last 150 years, artificial dyes have been produced to achieve a broader range of colors and to render the dyes more stable to washing and general use. Both dyes and pigments appear to be colored because they absorb some wavelengths of light preferentially. Yet, a distinction is usually made between a dye and a pigment. A dye is either a liquid or is soluble in its vehicle (such as water), resulting in a solution. By contrast, a pigment is insoluble in the vehicle, resulting in a suspension. In addition, a dye binds to the substrate, but a pigment generally has no affinity for the substrate. A colorant can be both a pigment and a dye depending on the vehicle it is used in. In some cases, a pigment can be manufactured from a dye by precipitating a soluble dye with a metallic salt. The resulting pigment is called a lake pigment. Different classes of dye are used for different types of fiber and at different stages of the textile production process, from loose fibers through yarn, cloth, and tailored garments. Acrylic fibers are dyed with basic dyes; nylon and protein fibers such as wool and silk are dyed with acid dyes; polyester yarn is dyed with disperse dyes. Cotton is dyed with a range of dye types, including vat dyes (similar to the ancient natural dyes) and modern synthetic reactive and direct dyes. Direct or substantive dyeing is normally carried out in a neutral or slightly alkaline dyebath, at or near boiling point, with the addition of either sodium chloride (NaCl) or sodium sulfate (Na2SO4). Direct dyes are used on cotton, paper, leather, wool, silk and nylon. They are also used as pH indicators and biological stains. Mordant dyes require a mordant, which improves the fastness of the dye against water, light, and perspiration. The choice of mordant is very important, as different mordants can change the final color significantly. Most natural dyes are mordant dyes and there is therefore a large literature base describing dyeing techniques. The most important mordant dyes are the synthetic mordant dyes, or chrome dyes, used for wool; these constitute some 30 percent of dyes used for wool, and are especially useful for black and navy shades. The mordant, potassium dichromate, is applied as an after-treatment. It is important to note that many mordants, particularly those in the hard metal category, can be hazardous to health and extreme care must be taken in using them. Vat dyes are essentially insoluble in water and incapable of dyeing fibers directly. However, reduction in alkaline liquor produces the water soluble alkali metal salt of the dye, which, in this leuco form, has an affinity for the textile fiber. Subsequent oxidation reforms the original insoluble dye. Reactive dyes utilize a chromophore containing a substituent that is capable of directly reacting with the fiber substrate. The covalent bonds that attach reactive dye to natural fibers make it among the most permanent of dyes. "Cold" reactive dyes, such as Procion MX, Cibacron F, and Drimarene K, are very easy to use because the dye can be applied at room temperature. Reactive dyes are by far the best choice for dyeing cotton and other cellulose fibers at home or in the art studio. Disperse dyes were originally developed for the dyeing of cellulose acetate and are substantially insoluble in water. The dyes are finely ground in the presence of a dispersing agent and then sold as a paste, or spray-dried and sold as a powder. They can also be used to dye nylon, cellulose triacetate, polyester and acrylic fibers. In some cases, a dyeing temperature of 130 °C is required, and a pressurized dyebath is used. The very fine particle size gives a large surface area that aids dissolution to allow uptake by the fiber. The dyeing rate can be significantly influenced by the choice of dispersing agent used during the grinding. Azo dyeing is a technique in which an insoluble azoic dye is produced directly onto or within the fiber. This is achieved by treating a fiber with both diazoic and coupling components. With suitable adjustment of dyebath conditions the two components react to produce the required insoluble azo dye. This technique of dyeing is unique, in that the final color is controlled by the choice of the diazoic and coupling components. Sulfur dyes are two part "developed" dyes used to dye cotton with dark colors. The initial bath imparts a yellow or pale chartreuse color. This is oxidized in place to produce the dark black we are familiar with in socks and the indigo blue of the common blue jeans. One other class, which describes the role of dyes rather than their mode of use, is the food dye. Given that food dyes are classed as food additives, they are manufactured to a higher standard than some industrial dyes. Food dyes can be direct, mordant and vat dyes, and their use is strictly controlled by legislation. Many are azoic dyes, although anthraquinone and triphenylmethane compounds are used for colors such as green and blue. Some naturally occurring dyes are also used. 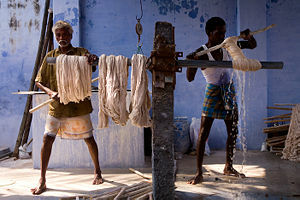 Manual dyeing of cotton in India. Dyes are applied to textile goods by dyeing from dye solutions and by printing from dye pastes. The term direct dye application stems from some dyestuff having to be either fermented as in the case of some natural dye or chemically reduced as in the case of synthetic Vat and Sulfur dyes before being applied. This renders the dye soluble so that it can be absorbed by the fiber, the insoluble dye has very little substantivity to the fiber. Direct dyes, a class of dyes largely for dying cotton, are water soluble and can be applied directly to the fiber from an aqueous solution. Most other classes of synthetic dye, other than vat and sulfur dyes, are also applied in this way. The term may also be applied to dyeing without the use of mordants to fix the dye once it is applied. 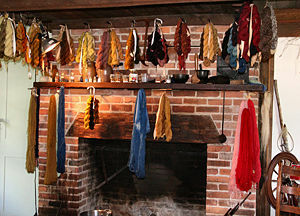 Mordants were often required to alter the hue and intensity of natural dyes and improve their color fastness. Chromium salts were until recently extensively used in dying wool with synthetic mordant dyes. These were used for economical high-color fastness dark shades such as Black and Navy. Environmental concerns have now restricted their use and they have been replaced with reactive and metal complex dyes that need no mordant. There are many forms of yarn dyeing. Common forms are at package form and at hanks form. Cotton yarns are mostly dyed at package form, and acrylic or wool yarn are dyed at hank form. The common dyeing process of cotton yarn with reactive dyes at package form is given here in brief. First, the raw yarn is wound on spring tubing to prepare a package suitable for dye penetration. These packages are loaded on a dyeing carrier's spindle, one on another. The packages are then pressed up to a desired height to achieve suitable density of packages, the carrier is loaded on the dyeing machine, and the yarn is dyed. After dyeing, the packages are unloaded from the carrier onto a trolley. All packages are hydro extracted to remove most of the water, then dried to obtain the final dyed packages that are packed and delivered. To remove natural or unwanted color from material, the opposite process of bleaching is carried out. If things go wrong in the dyeing process, the dyer may need to remove the dye already applied by a process that is normally known as stripping. This normally means destroying the dye with powerful reducing agents (sodium hydrosulfite) or oxidizing agents (hydrogen peroxide or sodium hypochlorite). The process often risks damaging the substrate (fiber), and it is often less risky to dye the material a darker shade—black is often the easiest or last option. Based on the nature of their chromophore, dyes are divided into several types, as listed below. ↑ Simon Garfield, Mauve: How One Man Invented a Color That Changed the World (London, UK: Faber and Faber, 2000, ISBN 0-393-02005-3). ↑ Index of Dyes Stainsfile. Retrieved January 24, 2008.